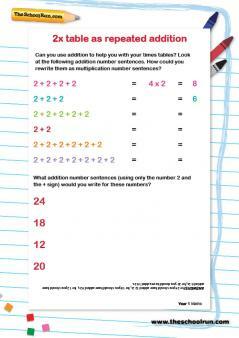 The 2 times table is the foundation of all multiplication tables learning. 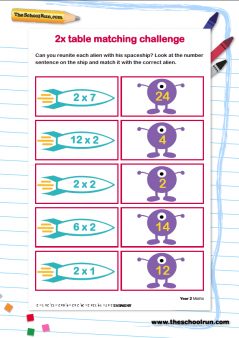 Follow educator John Bald's practical and very specific advice to help you support your child with the 2 times table and find links to worksheets and games to make practice fun. The 2 times table is the most important, and the one most likely cause problems if children have learned to count in multiples, as it is hard to replace two-four-six-eight with a table that alternates between single numbers and twos (1 x 2 = 2, 2 x 2 = 4, etc). 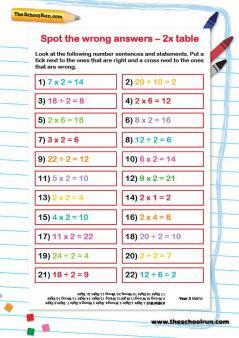 How do you say the 2 times table? When you practise with your child it's vital to be consistent in how you recite the number sequence out loud. Choose either "One two is two, two twos are four, three twos are six, four twos are eight", etc., or "Two ones are two, two twos are four, two threes are six, two fours are eight" as a starting point. 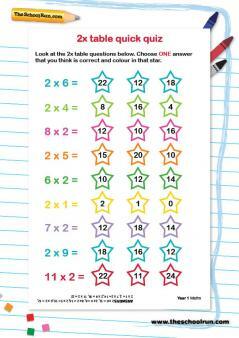 If your child is learning times tables at school use the same form, so that they're less likely to mix the two up. Take the table up to 5x2 to start with, and practise until this is fluent and accurate. Children often go wrong at 3x2. If this happens, go back to 2x2 and model the step, again using whichever form the school uses. Don't rush – brain cell connections are formed slowly in the first instance, and learning this table is creating a template for learning the others. Getting the columns mixed up (saying "two threes are six, three threes are..." by mistake) is much more about learning co-ordination than learning maths. Provided your child is getting just a little better each time, it's not a problem if they takes a little longer to learn than other children you know. If, though, they really find this stage hard, use a pile of 2p pieces as maths aids and have them count and say the table at the same time. Once they can say the table with the coins, take them away and try without. Have your child write down what he or she has just learned. Once they make it to 5x2 without any hitches, complete the table. 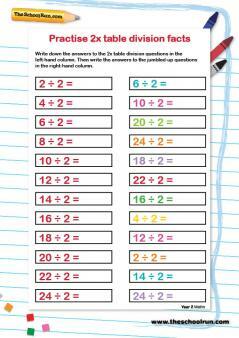 Ask your child if 2 is an odd or even number. If they know, then point out that every number in an even-number table is even. If not, then explain the difference between odd and even numbers, then make the same point. Parent. What are six twos? If necessary, go back one to five twos. Always go back to a calculation that is known, and build from there. I then point out that, once we have reached 5x2, the series of final figures repeats itself. 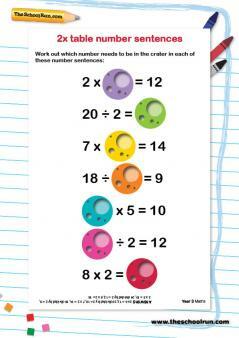 This helps build understanding of numbers and prepares children for larger tables with even numbers. For schools, I recommend focusing assistants' and volunteers' attention on getting 2s right and providing practice matched to individual needs. 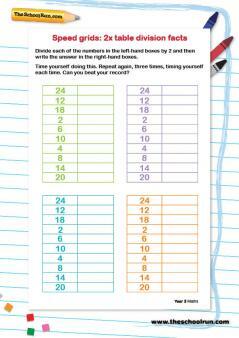 If 2s are not right, nothing else will be and children will try to recall higher tables by guessing. We do not guess – we think through, work out and understand. Try to have your child anticipate your questions, or ask you questions. Put in questions about the table at the oddest times, so that even asking a question becomes a little joke. For example, I sometimes pretend it is part of a perfectly normal conversation about something else, when of course it's not. The dead-pan approach can be quite amusing! 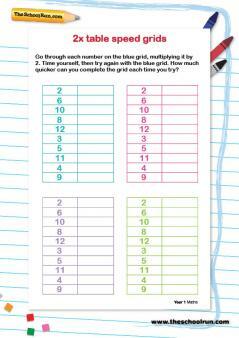 For a selection of 2 times tables worksheets see below. 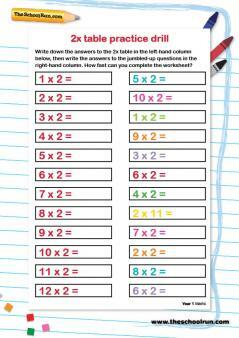 Read John Bald's guide to times table learning for more general advice about multiplication tables, then browse through all times table worksheets and printable games.